In 1984, I was hired as a cashier at Hardee’s in Columbia, S.C., making $4.25 an hour. By 2005, 21 years later, my pay was only at $8 an hour. That’s a $3.75 raise for a lifetime of work. Adjusted for inflation, it’s only a 2-cent raise. Andrew Puzder, the chief executive since 2000 of CKE — which owns Hardee’s, Carl’s Jr., and other fast-food companies — is now in line to become the country’s next labor secretary. The headlines ponder what this may mean for working people in America, but I already know. I already know what Trump/Puzder economics look like because I’m living it every day. Despite giving everything I had to Puzder’s company for 21 years, I left without a penny of savings, with no health care and no pension. Now, while I live in poverty, Trump, who promised to fix the rigged economy, has chosen for labor secretary someone who wants to rig it up even more. He’s chosen the chief executive of a company who recently made more than $10 million in a year, while I’m scraping by on Supplemental Security payments. No Comments on Andrew Puzder will be a disaster for workers. I know: He was for me. Where's Andy Puzder? President Donald Trump nominated him for secretary of labor two months ago, but his confirmation hearing has been delayed four times — reportedly due to his business ties. We take a look at the fast-food CEO's business tactics and his approach to labor issues. No Comments on Who is Andy Puzder? President Trump repeatedly promised during his campaign that he would both bring jobs back to America and create more jobs for people to support their families. By nominating Andrew Puzder, CEO of CKE Restaurants (the parent company of Carl’s Jr. and Hardee’s chains), Trump is blatantly betraying his promise to increase good job opportunities for hardworking Americans. 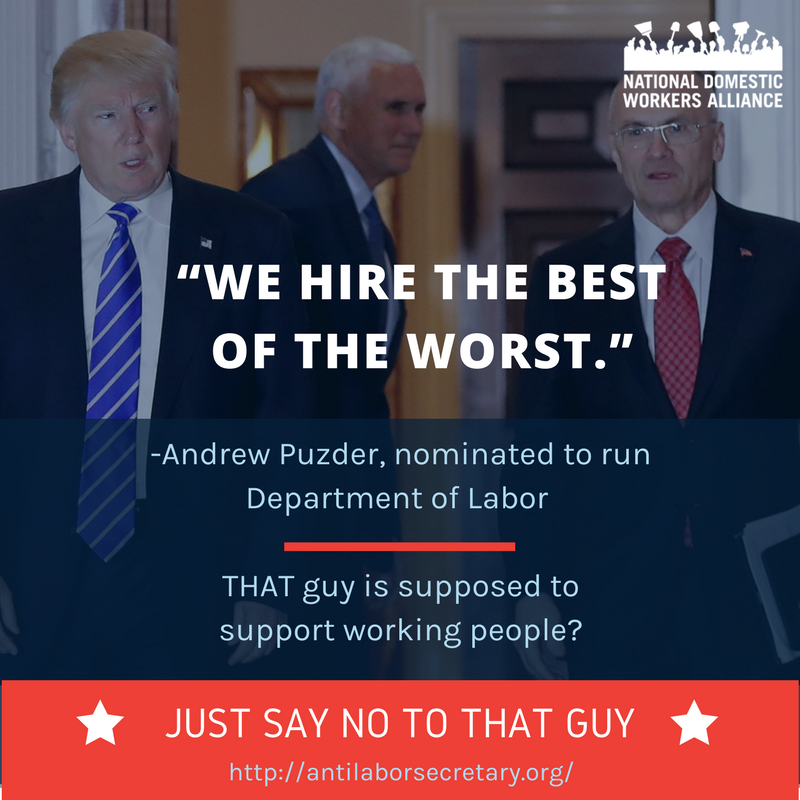 Puzder’s track record of limiting workers’ rights, fighting off employment lawsuits, and publicly speaking about his lack of respect for his employees makes him fundamentally unsuitable for this cabinet appointment. Therefore we must take a stand to prevent him from becoming the next Labor Secretary. Puzder’s nomination has met widespread opposition from unions, nonprofits, and even CKE employees. The AFL-CIO, The Leadership Conference on Civil and Human Rights, National Partnership for Women and Families, Equal Rights Advocates, American Sustainable Business Council, Farm Forward, and countless others have publicly urged Senators to reject Puzder’s nomination. The nomination of Andrew Puzder for secretary of labor is a grave betrayal of working people in this country. The mission of the Department of Labor is “to foster, promote, and develop the welfare of the wage earners of the United States, to improve their working conditions, and to advance their opportunities for profitable employment.” As the leader of this department, the secretary of labor serves as the steward of workers’ rights, charged with ensuring all workers have jobs that are safe, secure, fair and providing dignified wages. It is difficult to imagine a nominee more antithetical to this mission or more poorly suited to represent the nation’s workers than Mr. Puzder. As the CEO of CKE Restaurants (the parent company of Carl’s Jr. and Hardee’s fast-food chains) Puzder has overseen a business with a voracious appetite for labor disputes, a fondness for anti-worker practices, and utter disdain for the well-being and dignity of its workers. Puzder has engaged union-busters, vigorously opposed any meaningful increase to the minimum wage, and railed against the expansion of overtime eligibility. He has said that he “believe[s] in putting hot models in our commercials, because ugly ones don’t sell burgers.” This, along with his complaints about employees filing sexual harassment and discrimination lawsuits and opposing paid sick and family leave all add up to a direct attack on working women. Wisconsin working women and our families saw important gains over the past eight years. While we have more to do to achieve full equity and economic security, President Donald Trump’s pick for secretary of labor, Andrew Puzder, will only take us backward, something none of our families can afford. During Puzder’s 16 years as CEO of CKE Restaurants (the parent company of Hardee’s and Carl Jr’s,), the company has committed numerous violations of wage and hour and safety laws enforced by the Department of Labor. Puzder has attacked policies that would raise wages for women and people of color and close the gender and race pay gaps, including raising the minimum wage and extending overtime protections. Low-wage workers are least likely to have paid sick days and paid family and medical leave — despite the fact that they are the ones who need them most. That’s why 9to5 Wisconsin is leading work on the Wisconsin Family and Medical Leave Insurance Act, a bill that would provide partial wage replacement for workers who need to care for their own or a family member’s serious illness, childbirth or adoption. 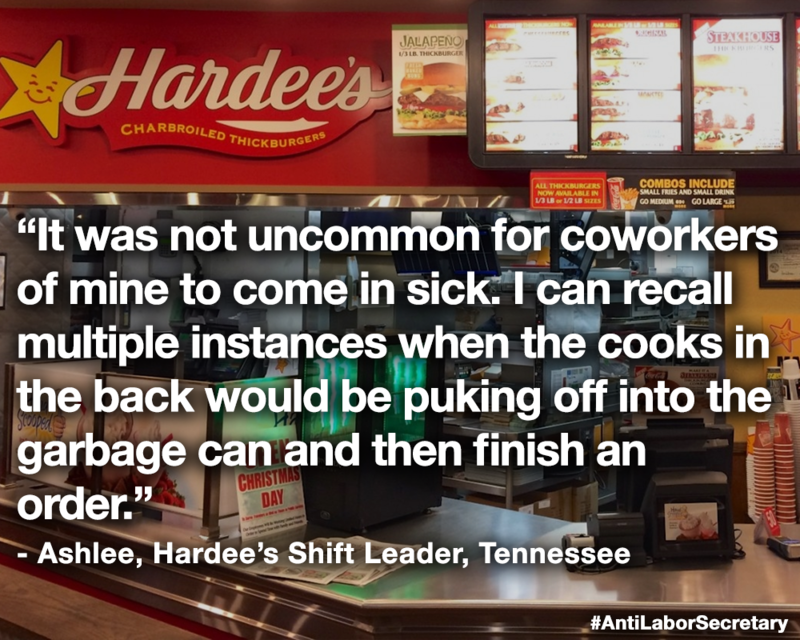 Managers at a Hardee’s restaurant in Alabama scrubbed workers’ hours from the logbooks in order to avoid paying them overtime. Hardee’s workers in Pennsylvania were required to pay 10 cents per hour for the privilege of wearing a Hardee’s uniform. Workers at a Georgia Hardee’s were told to clock out and sit in the parking lot when business slowed down. When it picked up again, they were told to clock back in and work. Managers at a Hardee’s in Missouri had money deducted from their paychecks whenever the cash register came up short. Adult workers at a Hardee’s restaurant in Iowa were paid a “sub-minimum wage” that was legal only for minors, while minors worked so late that their hours broke child labor law. In each of those cases, Labor Department investigators found that Hardee’s restaurants had violated federal wage-and-hour regulations and workers were entitled to thousands of dollars in backpay. Throughout this time, the Hardee’s brand has been overseen by Andrew Puzder, President Donald Trump’s nominee to be the next labor secretary. If he is confirmed by the Senate, Puzder would be responsible for enforcing the same worker protections that his company and its franchisees were caught violating, sometimes repeatedly.